Many times we take our political and ideological differences so seriously that we forget what we’re fighting for. We’re supposed to be fighting for the right, for the ethical treatment of all people, and for preserving the rights that will give us a sustainable society for generations to come. Yes, our ideology about how to achieve that is sometimes drastically different than those we might meet in a day, but treating them like trash will only broaden the divide and make us more unlikely to effectively communicate. Many of us never felt more mentally separated from our friends and families on the other side of the political aisle than directly following the election and inauguration of President Trump. That was the feeling that one waitress in Washinton D.C. had, until her experience with some Republicans in town to support the new President. 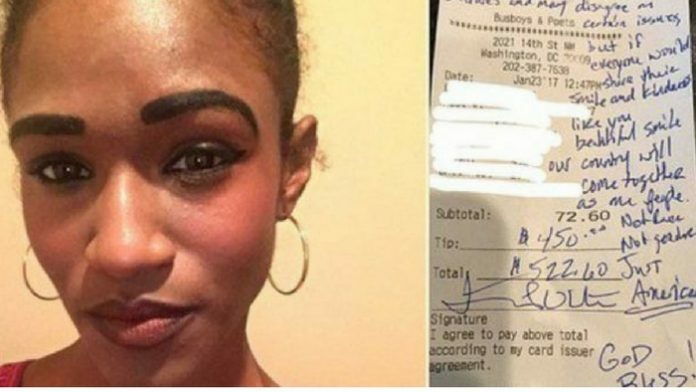 Rosalynd Harris is a black waitress who happen to serve a table of white Texan men wearing cowboy hats. 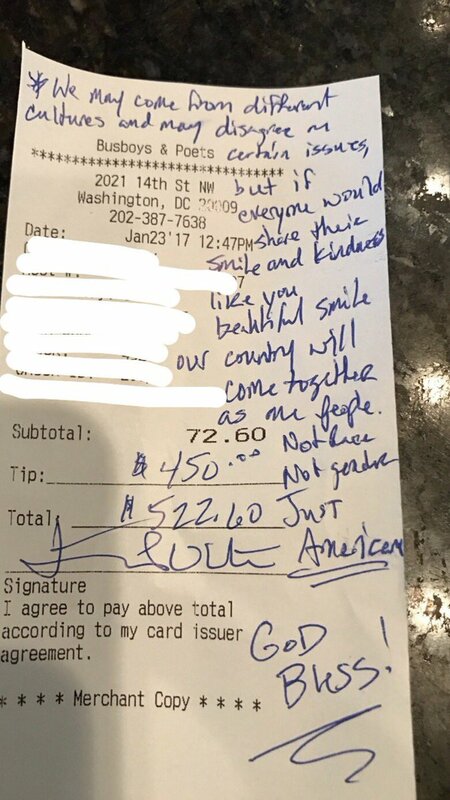 With only few days after Rosalynd had participated in the Women’s March; the men were in town for Donald Trump’s inauguration….the numbers on the receipt: a $450 tip for a “subtotal” of $72.60. But wait, along with this huge tip, came a note. This is such a fantastic example of someone embracing the American spirit. There wasn’t any “ha ha you lost” or “Democrats are dumb” talk from these people. They were just happy to have met someone who was kind and pleasant to them, no matter their political affiliation. We could use some more of their brand of kindness in our world today.